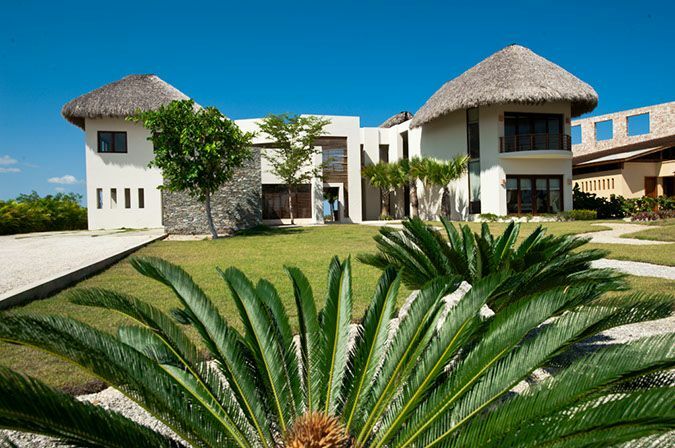 CAP CANA VILLA. Golf setting. Beautiful pool. Villa 'Las Golondrinas' is located In front of one of the lakes of what is planing to be in the future Las Iguanas golf course. It’s a villa with very open spaces and full of light. The golf course is not yet ready. The villa is made to entertain, relax, and most importantly to give you a relax and private vacation you have always wanted. It has a beautiful pool and a private and quiet surrounding. At a walking distance one can find the Golden Bear Lodge with tennis courts. Punta espada golf course is walking distance, and punta espada club house is 6 minute by golf cart or 3-4 minutes by car. Juanillo beach, is the closest beach. It’s 2 miles away from the villa. API beach it’s a little bit farther, but also inside CapCana. Scape Park (an adventure park), and the bigest marina in the Caribbean are also inside CapCana. A bit further out is Punta Cana Village, Manatí Park, Caves, casinos, blue mall, and more. All at your convenience. A Gated comunity. A family, friendly and safe environment. Located in a cul de sac with an additional guard at the entrance. CapCana hosts the best rated golf course in Mexico and the Caribbean. The villa is located in front a lake. It’s a peaceful atmosphere with very nice people. The closest free beach to the villa is Juanillo. It takes around 15 minutes by golf cart. 4 minutes by car. You don’t need to go out the resort to enjoy the beautiful beaches and go to restaurants. 24 hours gated community. The villa is in a cul de sac with an additional guard at the entrance. Several restaurants are located inside CC. We are in front of las iguanas golf course. Still close. We are in front of “Las Iguanas” Golf course. which at this time is close. The lake in front of the villa is a small lake which belongs to the golf course. 200 mts. from the house @ Golden Bear Lodge. There is a fee for using them. Need to let us know in advance if a guest is coming with a wheelchair so we can make the adjustments for it. Juanillo beach and API beach are open to cap Cana guests. The price includes a housekeeper and a certified chef. The house management offers different services like doing your groceries, picking you up at the airport, helping with reservations, etc. Please ask us about anything! Tip is expected and is not included in the price. Thank-you! Scuba diving and kite surfing is available at a short car distance. Kite surf depends much of the winds and season. If you need any information for these activities, please e-mail me. Amazing home, staff is like family and the food is amazing! Great stay, everything we need was available and the location was very secure, beautiful and well taken care of. LOVED IT! Thank you very much Amy, I’m glad you enjoyed your stay. Yes, the staff is great! They are very nice people. We hope we can see you again. Great house .... great staff .... best golf course on earth !!! Perfect location for outstanding golf . Have repeated use of this home for 10 years now . Thanks for always being so nice with the staff. They appreciate you and your family and friends very much. We just returned from 5 days at this lovely villa. Our family enjoyed the secluded peacefulness of this property. We were looking for family time to relax, reconnect, enjoy some good books, swim and all of those wishes were met. The main living area and pool are fabulous! Nice to have the option of shade right off the pool deck. The bedrooms and baths were comfortable, air conditioned and clean with nice linens and towels. I will admit it took us a night to get used to the open air concept of the main living areas, with the visiting birds, hermit crabs and tiny lizard here and there-but our teenagers loved it and it really added to the vacation feel of this property. I can't say enough about Antolin, the chef, and Nancy, the housekeeper. They anticipated and met every possible need of ours with a gracious and smiling demeanor. The food was outstanding, fresh pool towels every day, turn down service and cold water at our bedsides every night. We felt so pampered. If you are looking for a party/resort atmosphere for your vacation, this may not fit the bill. But if you are looking for relaxation, great service and a beautiful pool book this villa now! Close to Sanctuary Town, golf, ScapePark adventures, the beach, the marina...all moments away within the same gated Cap Cana resort. Easy and responsive communication with both the owner and the property managers (Leonardo and Alejandro), who stopped by every morning to ensure everything was to our liking. Thanks for a great vacation! Thank you Sheila, I’m glad you had a good time. Even the golf course in front of the villa is close, it is a beautiful view to it and the lake. Very peaceful. The house is very spacious, beautiful and just as advertised. The pool and hot tub is very big and secluded in the backyard as well. But more importantly, the caretaker, the chef, the cleaning service, and the concierge / driver were all incredible and are a big reason that our entire week was simply amazing! Thank you very much for rating the villa. I'm glad you had a wonderful stay. We hope to have you again soon. I will let the staff know your comments . As always, our priority will be to do our best to make your stay as pleasant as possible. Just 15 minutes from Punta Cana airport in an gated community. Located in front of the 17th hole of Jack Nicklaus design golf course “Las Iguanas”, which is currently close. Villa Las Golondrinas is a perfect place to relax and enjoy. This beautiful villa offers a full-time maid, who will pamper you and take care of your laundry. Other Activities: horse back riding, visit to the 'hoyo azul', scuba diving, snorkeling, fishing, sailing, kite surf, cassino, tennis, zip-line, buggies, restaurantes, spas,, and golfing. Golf: The challenging and beautiful Punta Espada Golf course is rated # 1 in Mexico and the Caribbean. We have some Kosher cookware and knives.